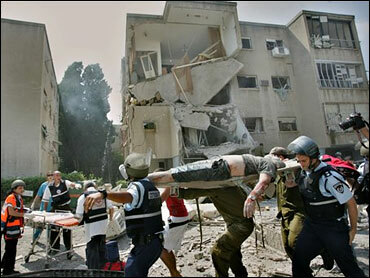 A Hezbollah rocket destroyed a three-story building in Haifa and wounded at least five people, Israeli medics said. The rocket attacks came a day after a Hezbollah attack on the port city killed eight people. Also, Israeli ground forces briefly entered southern Lebanon Monday to attack Hezbollah bases on the border, as they have been doing for several days. Fighter bombers pummeled Lebanese infrastructure Monday, setting Beirut's port ablaze and hitting a Hezbollah stronghold in attacks that killed at least 17 people. "The bombs started earlier than usual this morning, at about 6 a.m.," said CBS News' Kristin Gillespie in Beirut. "They sound almost like thunder, and then you can see the smoke that drifts up into the air after the bombs hit their targets." The militants group retaliated by firing rockets that flew further into Israel than ever before. Israeli planes and artillery guns killed 17 people and wounded at least 53 others in the overnight attacks, Lebanese security officials said as the death toll from the conflict rose to more than 200 — 196 in Lebanon, according to the officials, and 24 in Israel. The strikes have been concentrated in a very small area about one square mile, reports CBS News correspondent Elizabeth Palmer in Beirut. Outside the capital, specific targets include crucial transportation links like bridges and roads, choking off normal movement. An Israeli soldier was killed during a raid in the West Bank town of Nablus when Palestinians detonated a bomb, reports CBS News correspondent Robert Berger. The army says it has information that militants in Nablus are planning suicide bombings in Israel. A suspected bomber was caught today here in Jerusalem. A senior European Union official returned Monday from the Middle East and said he is pessimistic about the chance of a cease-fire between Israel and Hezbollah militants, but Iran's foreign minister said Monday he believes a cease-fire between Israel and Hezbollah is feasible. A U.N. envoy was also optimistic. President Bush is heading home from the G-8 Summit in Russia frustrated over the relentless Middle East violence and the slow pace of efforts to end it, reports CBS News White House correspondent Peter Maer. An open mike caught him using an expletive to complain about Syria and Hezbollah. Mr. Bush also indicated Secretary of State Rice would soon head to the region. Israel on Monday bombed the empty Palestinian Foreign Ministry building for the second time in less than a week, calling it a warning to the ruling Hamas and keeping up pressure as it searched for a kidnapped soldier. CBS News Reporter Amy Guttman reports the students say there is anger and resentment among the Americans they left behind in Beirut. They cite European nationals whose governments acted swiftly to evacuate them. Guttman says there are reports that some Americans have been told by the U.S. Embassy that they could be stuck in Beirut for as much two more weeks. Israel said its planes and artillery struck 60 targets overnight. Its military sought to punish Lebanon for the barrage of 20 rockets on Haifa, the country's third-largest city and one that had not been hit before the current round of fighting began last Wednesday. Israeli Prime Minister Ehud Olmert vowed "far-reaching consequences" for the Haifa attack. The eight deaths made it Hezbollah's deadliest strike ever on Israel.